Front of the mouth includes the tongue. Also, includes the flap under the upper lip (frenulum). Tongue. Cuts of the tongue or inside of the cheeks are the most common mouth injury. Usually, due to accidentally biting them during eating. Bites of the tongue rarely need sutures. Even if they gape open a little, the cuts usually heal quickly. If the edges come together when the tongue is still, it needs no treatment. Upper Lip. Cuts and bruises of the upper lip are usually due to falls. The piece of tissue joining the upper lip to the gum is the frenulum. A tear of the upper frenulum is very common. It always heals without sutures. However, it will rebleed every time you pull the lip out to look at it. Lower Lip. Cuts of the lower lip are usually caused by the teeth. They occur when catching the lip between the upper and lower teeth while falling. Most of these cuts do not connect (don't go through the lip). These do not need sutures unless the outer cut is gaping. Serious injuries are those to the tonsil, soft palate, or back of the throat. Examples of these injuries include falling with a pencil or toothbrush in the mouth. Puncture wounds here can cause a deep space infection in the neck. Fever and mouth looks infected. Signs are increasing pain or swelling after 48 hours. Note: it's normal for a healing wound in the mouth to be white. Cuts of the inside of the upper lip are very common. Often, the piece of tissue that connects the upper lip to the upper gum is torn. This tissue is called the upper labial frenulum. The main symptom is oozing tiny amounts of blood. This cut always heals perfectly without sutures. For bleeding from the frenulum, use direct pressure. Press the outer lip against the teeth for 10 minutes. Caution: Once bleeding has stopped, don't pull the lip out to look at it. Reason: The bleeding will start up again. It's safe to look at it after 3 days. Most children who fall and bite their lower lip have 2 cuts. They have cuts to both the outside and inside of the lip. Catching the lower lip between the upper and lower teeth causes the 2 cuts. This tends to happen in children with an overbite. Most of these small cuts do not connect with each other. For bleeding from the lip, use direct pressure. Press the outer lip against the teeth for 10 minutes. Bites of the tongue rarely need sutures. Even if they gape open a little, tongue cuts usually heal quickly. If the edges come together when the tongue is still, it needs no treatment. 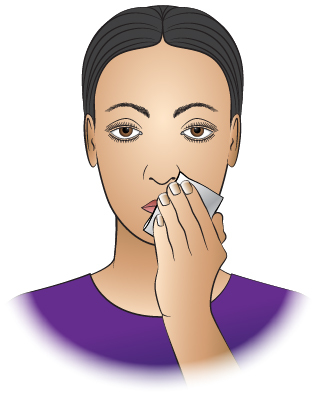 For tongue bleeding, try to press on the bleeding site with a sterile gauze. You can also use a piece of clean cloth. Do this for 5 minutes if it's practical. Cuts of the tongue normally tend to ooze a little blood for several hours. This is due to the rich blood supply in the mouth. For constant oozing of blood, can use a moistened tea bag for 10 minutes. (Reason: tannic acid released from the tea bag may stop the oozing). Put a piece of ice or popsicle on the spot that was injured. You can also use a cold wet washcloth. Do this for 20 minutes. Try to get your child to drink adequate fluids. Cold drinks, milk shakes, popsicles, slushes, and sherbet are good choices. Solids. Offer a soft diet. Also avoid foods that need much chewing. Avoid citrus, salty, or spicy foods. Rinse the wound with warm water right away after meals. Small cuts and scrapes inside the mouth heal up in 3 or 4 days. Infections of mouth injuries are rare.